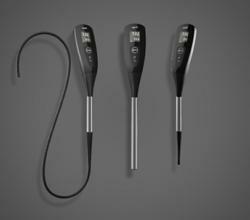 Senova Systems’ pHit™ pH sensor debuts at Pittcon 2012 on March 12, 2012. This revolutionary platform replaces current glass electrodes with solid state smart sensors that contain no glass, require no user calibration, and can be stored dry. “This is a genuine breakthrough! Senova Systems’ pHit sensor solves so many of the costly and frustrating limitations associated with today’s glass pH electrodes. Senova Systems Inc., today announced that Pittcon will be its platform to introduce the first calibration-free, solid-state pH meter: pHit™ pH sensor. “This is a genuine breakthrough! Senova Systems’ pHit sensor solves so many of the costly and frustrating limitations associated with today’s glass pH electrodes. Of course everyone is excited by the calibration-free feature but we are also developing mini and micro sensors that, through partnerships with leading companies, will enable new advances in analytical instruments, single-use process systems, peptide sequencing/ synthesis and ultimately, new medical devices, ” commented Chris van Ingen, Former President of Agilent Technologies’ Bio-Analytical Business Unit and Board Director of Senova Systems. “This is a milestone event for Senova Systems. The pHit sensor platform offers a revolutionary, robust, and highly accurate way to measure arguably the most fundamental property in all of nature. In the near term, there is pent up demand for the pHit scanner because it removes the tedium and uncertainty from pH measurement in the laboratory environment. We fully expect that through partnerships with other cutting edge companies, our smart sensor platform will enable new medical devices, advances in crop science and will enable scientists to better understand critical changes in oceans and waterways around the world, ” said Lee Leonard, President and CEO of Senova Systems, Inc.
Prototype versions of the pHit hand held scanner can be viewed at Pittcon booth #2482, from March 12th - 15th. The Company expects to be shipping product in Q3. Senova Systems develops, manufactures and sells next-generation sensor systems based on coupling its patented chemistries with advanced materials, and proprietary microelectronics. Senova Systems’ first focus is a revolutionary new pH sensor platform, which replaces current glass electrodes with solid-state, smart sensors that contain no glass and require no user calibration. This breakthrough offers significant operational and economic benefits in the life science, food and beverage, dairy, petrochemical, water and environmental sectors, and will ultimately enable novel advances in healthcare and other specialized applications unachievable with conventional pH electrodes.